Located less than 30 miles northwest of Denver is the eco-friendly college town of Boulder, Colo. Boulder is a magnet for artists, musicians, and young tech-savvy startup companies. The town is home to Z2 Entertainment, which owns the Boulder Theater and Fox Theatre, Boulder’s two largest music venues for nationally touring acts. Karen Shaviv is the production manager at Z2 Entertainment. A 15-year industry veteran, Shaviv started out as an intern at the Fox Theatre in Boulder. Today her roles include light design, sound engineering, and house, stage and staff management at the Boulder Theater. Along with artist and crew relations, heavy lifting of band and stage equipment as well as technical production aspects are all part of the job. Out of 40 employees in Z2’s Boulder Theatre production department, only four are women, including Shaviv’s assistant. Two of those female employees work light design and only one — Shaviv herself — is a sound engineer. 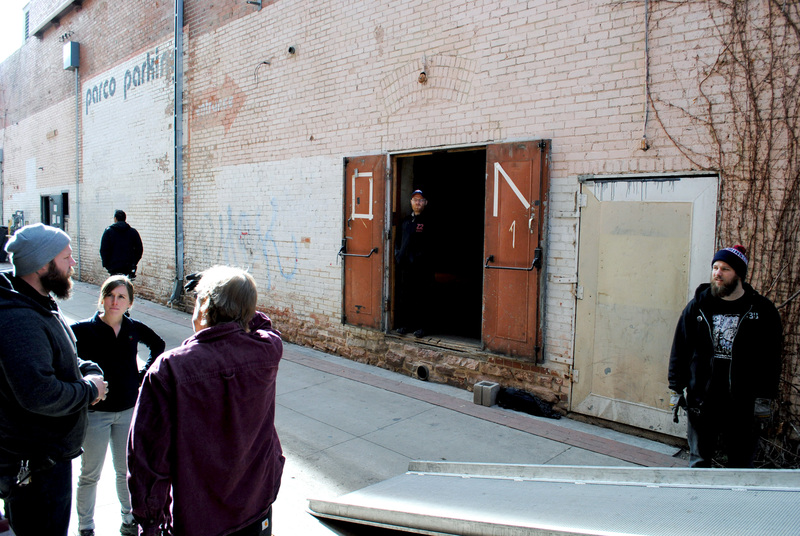 Linsdsey Dubey talks with production crew before a December morning load in at the Boulder Theater. Photo by Lauren Maslen. The Fox Theatre’s assistant production manager Lindsey Dubey says commanding an air of respect is necessary in her position. That comes naturally to her, she says, but she’s also had to build a stellar reputation. It’s a requirement on the job which is only possible with hard work, persistence and time. At only 26 years old, Dubey’s earned that stellar reputation around the Colorado festival scene, working stage managing positions everywhere from Hanuman Festival in Boulder to Rocky Mountain Folk Festival in Lyons, Colo. Dubey worked her way up from an internship at Z2 after graduating from Michigan State and says that although she’s constantly being challenged in her career, each day is rewarding and only pushes her further in her career. Dubey says that on her days off, she’s at venues listening to music. She works for a company that believes in her and is like a family. And the end of the day, it’s all worth it to do something she truly loves. Linsdsey Dubey works with production crew during a December load in at the Boulder Theater. Photo by Lauren Maslen.